My first book “Rediscovering growth: After the crisis” was published on 23rd November 2013. The book summarises my views on why the western economies – including the UK – appear to be in a “New Normal” of disappointing growth following the 2008/9 financial crisis. And it sets out an agenda for escaping from this current sluggish phase of economic expansion. Three powerful tailwinds which supported economic progress in the West from the 1980s until the mid-2000s have disappeared – easy money. cheap imports and confidence in the policies of central banks and governments. Because these benign conditions will not be quickly or easily restored, there is no rapid escape from the economic doldrums. But my book offers hope that western economies like the UK can make a transition towards a new phase of stronger and sustained economic growth, as businesses adapt to changes in the financial system and the global economy and as long as governments follow the right polices. Government policies should not seek to re-create the pre-2007 “old normal”, but to encourage our economies to adapt to a new world, shaped by advances in technology, a more restrained financial system and the growing economic importance of economies in Asia and other emerging regions outside the West – where the bulk of the world’s population lives. Some western economies are better placed than others to make this adjustment. The traditional poles of western growth have been northern Europe (including the UK) and North America. These more flexible and dynamic economies are most likely to lead a return to stronger economic performance in the West, drawing on their longstanding technological, business and financial strengths. The economies of southern Europe are much less well placed and face a prolonged and difficult economic adjustment. Scroll down to read my blog summarising the main conclusions of the book. And click here to buy the book from the publisher, London Publishing Partnership. You can also buy it from all the normal outlets, including Amazon. Can we rediscover growth after the crisis? There are encouraging signs that the UK economy is picking up after very sluggish growth in 2011 and 2012. Growth strengthened in 2013 and forecasts for 2014 have been revised upwards significantly, with the UK now expected to be the fastest growing G7 economy this year. PwC’s latest economic forecasts suggest GDP growth of around 3% in 2014 after 1.7% growth in 2013. This improvement is welcome, but the bigger picture shows a disappointing economic recovery for the UK and other western economies. Even with the pick-up that current forecasts now suggest for the British economy, annual GDP growth is likely to average just over 1.5% in the first five years of recovery – 2010-14. That is about half the economic growth rate in the recovery from the early 1990s recession, when the UK economy grew by 3.3% on average in the five years 1992-96. And this pattern of disappointing growth is being seen across Europe and in the United States. There are many misunderstandings about the reasons for disappointing growth. It is not due to a deflationary global economy, as in the 1930s. Emerging market economies have not had difficulty finding growth opportunities – and their performance has been strong both before and since the crisis. Inflation has been a bigger problem than deflation for many economies around the world since the financial crisis – including the UK. Nor is weak growth the product of restrictive economic policies – fiscal austerity or a lack of monetary stimulus. Across most western economies, government spending restraint and tax increases have not been severe, and monetary policy remains extremely loose. 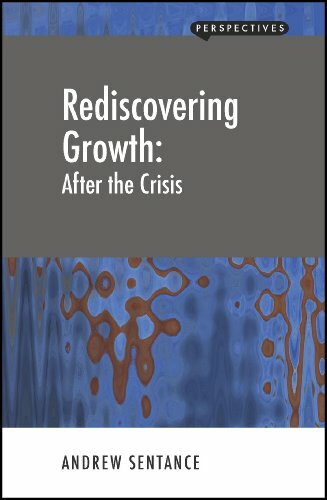 My analysis of the reasons for this disappointing growth phase and how we might escape it are contained in my book which was published at the end of last year: Rediscovering growth: After the crisis*. Its central thesis is that the major western economies – in Europe and North America – have entered a “new normal” of disappointing economic growth and heightened volatility. Three powerful tailwinds which supported growth across the western world from the 1980s until the mid-2000s – easy money, cheap imports and confidence in the policies of governments and central banks – have disappeared. And because these tailwinds are now absent, a quick and easy escape path from this pattern of slow growth across the West is unlikely. But that does not mean we should be pessimistic about the longer term economic outlook. There is hope of a return to a more stable and sustained world of economic growth if we can learn the right lessons from previous twists and turns in our economic fortunes and adapt them to the circumstances we now face in the early 21st Century. What are those lessons? The first is that well-functioning and flexible economies can and do regenerate themselves. The turnaround in the British economy in the 1980s provides a good example of this. The UK economy expanded at an average rate of over 3% per annum from the late 1940s until the early 1970s and then appeared to hit a brick wall after the mid-1970s recession. UK economic growth between 1973 and 1982 averaged less than 1% per annum. Pessimism was rife in the early 1980s, and there was widespread social unrest. 364 economists wrote to The Times newspaper to protest at the failings of government economic policy. And yet the British economy achieved a remarkable turnaround in the 1980s and set off on another quarter century of 3% plus growth in which the size of our economy doubled (see chart). This new “golden age” of economic growth was only brought to an end by the global financial crisis. The second lesson, however, is more challenging. In order to get on a new growth path, painful adjustments in our economies and societies may be necessary. And we cannot guarantee that the necessary changes will take place in countries where there may be strong political resistance to change. Japan provides a very good example of this. Japan has built its economic success on a very productive, efficient and dynamic manufacturing sector. But from the mid-1990s onwards it has been clear to many observers that Japan needed to reform its labour markets and develop a more productive services sector to complement its very successful manufacturing industry. To date this has not happened, and hence Japanese growth remains in the doldrums. For Japan, its inability to undertake these structural changes is a much more important factor holding back growth than the legacy of its financial crisis in the early 1990s. There are many other examples of economies which have struggled to recover past glories because they could not make the adjustment required. For example, Spain, Italy and Portugal, which flourished in the 1400s and 1500s, were overtaken by the major northern European powers including Britain, and have struggled ever since to re-establish their economic prowess. The third lesson is that we should not expect the next growth phase to be like the last one. In the 1950s and 1960s, growth in the western world was boosted by post-war reconstruction, an emerging middle class in Europe and North America, and the new technologies which had emerged in the 1920s, 1930s and during the Second World War. The development of mass markets for consumer products like motor cars, washing machines and transistor radios were key features of this post-war growth phase. The next growth phase, which started in the 1980s and developed momentum in the 1990s, was supported by a very different set of forces: financial deregulation and liberalisation; the opening up of the world economy; and the revolution in information and communications technology which brought us the internet and mobile phones. It is not possible to pinpoint exactly what might drive a new growth phase which could become established later this decade. The experience of previous growth phases can offer only limited insights – we need to look forward rather than back to the past to identify emerging new technologies and business and consumer trends. But there are common conditions which have underpinned the two major growth phases we have seen in the modern postwar era – a supportive financial system and confidence in the stability and sustainability of economic policy. These preconditions do not yet seem to be in place to support a return to stronger growth in the major western economies, though they could be later this decade. The final lesson I would highlight from past experience is that some countries and some businesses are likely to be much better placed to ride the changing tides of economic growth than others. Northern Europe – including the UK – has been an economic powerhouse for the world economy for at least three centuries now. North America and other offshoots of European civilisation developed and flourished in the 19th and 20th centuries – led by the United States. And it looks likely that the Asia-Pacific region – led by China and India – will be the economic powerhouse of the 21st century. Looking ahead, we should expect these three regions to continue to provide the main support for economic growth across the world economy. Elsewhere, economic prospects look more uncertain and more variable. The message of my book is that we can rediscover growth in the UK and other western economies. We are not doomed to continuing stagnation and economic decline. But economies need to change and adapt – in business, finance and government. In a number of western economies, there is work in progress and a transition is underway – and the UK is better placed than most to succeed in our “new normal” world. Want to know more? You’ll need to buy the book to read the whole story. But it is only £4.50 as an e-book (Kindle, etc) and £7.99 in paperback. Order now to beat the rush! * Rediscovering growth: After the crisis is published by London Publishing Partnership and will be available from Saturday 23rd November. It can be ordered from LPP, Amazon and other booksellers.